Sometimes they are just used as an ice breaker and to get the discussion going. The way you handle these strange interview questions is the most important criteria. Acknowledge funny interview questions with a smile and pause to collect your thoughts before answering. Here are some examples of these type of interview questions to get you thinking. 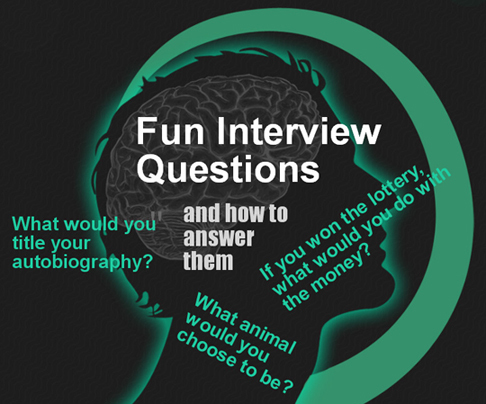 These interesting personal interview questions attempt to explore your own ideas and interests. The key to handling these funny interview questions is to not get rattled but breathe and think before answering. You do not have to be brilliant or wildly funny, you just have to work through your own thought processes, stay in control and present an answer. This superpower question is supposed to explore qualities you admire and aspire to. You can just play along without taking it too seriously or you can focus on a superpower that will help change the world or that would enable you to perform the job super-effectively! Whatever direction you take with your interview answer always have a reason ready for your choice. Select a time that you know a little about so that you can support your answer with a few facts. Don't forget about the future as an option. Always have a couple of quotes at the ready. Think about why you personally relate to the quote. Explores your goals and aspirations. Options include spending the money, investing it or donating it to charity. Often the best route to take is all three - buy something you really want, invest wisely and donate some to your favorite charity. Say you are dead — what would your eulogy say about you? If you were a brick in the wall which brick would you be? Tech companies and start-ups like to ask candidates interesting interview questions that are off-the-wall and require quick, creative thinking. A number of non-tech companies have also adopted seemingly crazy interview questions. It's not only about your answer but about how you work your way to get there. Answering these type of interview questions in a calm and considered way will inspire confidence. This fun interview question was made famous by Microsoft. There are definite factual answers to this. A round manhole covering cannot possibly fall through its circular opening while it is possible for a square manhole cover to fall through the hole if inserted diagonally. There is no rotation required to align a round manhole cover in the circular hole which minimizes the chances of human error in replacing the cover. A circular cover can be rolled to easily move it. 2. How do you weigh an elephant without using a scale? Think of the Archimedes Principal! One approximate answer is to submerge the elephant in a tank of water and measure the volume of water displaced knowing that water weighs 1kg per liter. 3. How would you market ping pong balls if ping pong itself no longer existed? There are a couple of options. You can focus on alternative uses for the ping pong ball such as creating a flotation device for kids. Introduce a new game using ping pong balls. Re-market the game of ping pong itself. 4. Why is a tennis ball fuzzy? The answer to this fun interview question is all about the functionality and aerodynamics of the ball. The fuzzy covering on a tennis ball slows the movement of the ball through the air and helps regulate the bounce of the ball. The reason tennis balls are bright fluorescent yellow is so that they can be more easily seen on television by viewers. 5. How many smartphones are there in New York City? Use the estimated population of NYC (8.2 million) as a baseline and work around that. Go through a structured thought process to reach your estimate. How many phone books are there in New York City? How many gas stations in the US? Nobody expects you to know the answer to these type of questions but they will judge you on the way you come up with an answer. 6. How many light bulbs are in this building? Ask questions to find out how many people work in the building and how many floors it has in order to go through a logical process to present your best interview answer. Potential employers are more interested in how you respond to fun interview questions than the answer itself. They will evaluate your thinking skills and your ability to remain composed under pressure rather than the "correct" answer. Be ready to respond to unusual interview questions and convince them you are able to think on your feet. Behavioral interview questions can also be a challenge. Use these sample answers to prepare. Know how to handle inappropriate and illegal interview questions. If you could get rid of one U.S. state which would it be? Obviously there are no correct answers, only the expectation that you have a well-considered reason for the answer you give.